A great golf cart battery is able to provide you an extreme performance and allows you to have a pretty good experience while on the golf court. Additionally, a good battery allows you low maintenance, less serving cost, longer service and many more facilities. Golf cart batteries are not only for golf carts, but also you can use this for many purposes, such as battery for solar panels, smart converter chargers, as RV battery and many more. Here, we have reviewed top 5 batteries. After reading this entire article, you will learn about which one is the best, which is the longest lasting or which one will fit most with your golf cart. As well as, we have some tips about how can you extend the battery life and keep the performance and how can you check a battery. So, if you want to buy a new one, let’s start reading this detailed review article. 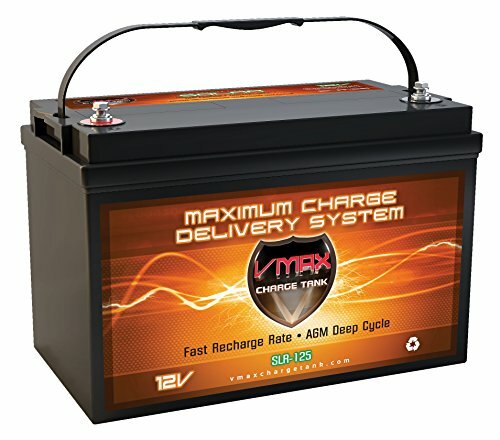 The Vmaxtanks Vmaxslr125 is a 125 Ah 12 volt deep cycle battery. As it is a heavy duty battery so it can be used for smart chargers, Pv solar panels, inverters and wind turbine. Also, this battery can be used as a RV battery. The battery has high capacity and high quality of power and this is a SLA rechargeable battery. That’s why this battery is too popular to the users. The most wonderful feature is, the battery is made by using military grade alloy and it provides a long life battery or long battery cycle. For this reason, you can recharge and use the battery again and again. Additionally, the battery has a very low self discharging rate. So, it’s able to back up for more power when you keep the battery stand by or as a power back up. The battery provides 125 Ah at 20 hours discharge rate. This heavy duty battery has float service life span of 8-10 years and that is too good. On the other hand, the battery is designed for 99% recombination capabilities and the battery is highly safe from dangerous fumes of gases. We said before, this battery can be used as a solar panel power storage or wind turbine power storage. The battery is suitable for 175W-450W rated solar panels. Generally, we use solar panels or wind turbines among these power output. So we can say that the battery is suitable for almost every solar panels and wind turbines. The dimension of the battery is 12.9x6.8x8.7" (LxWxH). This is a group 31 battery. People who used this battery found very user friendly and professional as well as workable. 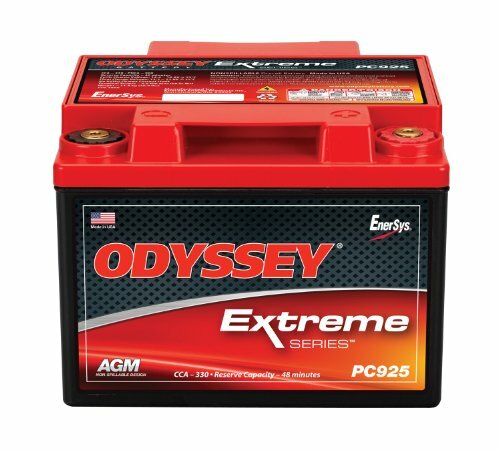 The Odyssey PC925 is a multi purposes battery. Along with the golf carts, the battery is also suitable for Racing bikes, Snowmobiles, ATV, Motorcycles, Car audio etc. The perfect combination of power and performance has made the battery more excellent for a huge range of commercial, racing, applications, marine, auto/LTV, and power sports. The battery is able to deliver twice the overall power and 3X times of the other conventional batteries. As well as the battery is specially designed for providing high current by maintaining stable voltage, isn’t it great? That does happen because of very low internal resistance. He Robust connection of inter cell for resisting the vibration and eliminating the internal sparking. For extreme vibration resistance, the battery has plate separators of compressed TPPL. And the battery is made with pure lead plats in order to provide more power. The lead of the battery is 99.9% pure and extremely thin. That means more plates can be fit into the battery. And more plates means more power. And the battery has 330 cold crank AMP (CCA) which means the battery is extremely workable in any temperature of -45 degree to 45 degree Celsius. The battery has a longer service life. The battery also has AGM (Absorbed Glass Mat) technology so the battery is able to characteristics of 2 separate batteries. Besides providing enormous cranking power, the battery can also be used as a deep cycle battery. Additionally, the battery can be mounted very easily and anywhere with its flexible mounting capability feature. The non spill able design reduces the vibrations. The dimension of the battery is 11.2x10.5x8.3 inches (LxWxH). The battery is capable to provide engine cranking pulses of more than 2250A for 5 seconds. Also, the battery has 400 cycles at 80% depth of discharge (DOD). That’s why it can be used as jump starter too. No major disadvantage with this battery. 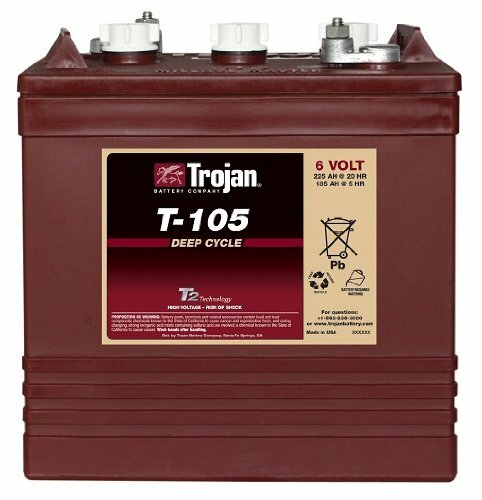 Trojan T-105 is a very compact battery. The dimension of the battery is only 10.3 inches in length by 7.1 inches in width by 10.8 inches in height. This one is a flooded lead acid battery and of 6 volts and 225 Ah amperage. Trojan T-105 is made for performance and it does it great. With the compact packs of these batteries in your golf cart, you will feel confident as they are highly able to take your golf cart through each game. And they are able to do it again and again. Trojan makes the golf cart batteries from 1852. The Trojan T-105 is their flagship golf cart battery model and these batteries are keeping the customer satisfied from a long time ago until now. This battery has Trojan’s advanced proprietary Maxguard® design separator. Along with that, it also has Alpha Plus® paste formulation that extends the battery run time, increases battery life and decreases the battery maintenance. This battery also has reliability, durability and proven technology so you can completely depend on Trojan batteries. The batteries will present you consistent performance for day in & day out. The battery’s cells are specially designed for deep cycling for less susceptible to degradation due to deep cycling. In this battery, Trojan used thick plates so that it can provide fewer peaks current. This awesome battery is suitable for multi purposes uses such as electric vehicles, photovoltaic systems and uninterruptible power supplies. Thicker plates that delivers less peak power. Less volt so you need more of them to run the cart. The UPG UB 12350 is from the manufacturer named Universal Power Group. This is a lightweight, small and compact battery with full of power. The weight of the battery is only 46 pounds. That’s why this is perfect for inflatable. This is a SLA battery with 35 Ah and 12 volts. This sealed lead acid battery offers premium quality of AGM (Absorbed Glass Mat) technology. This battery is ideal for motorcycles, personal watercrafts, snowmobiles or ATVs. This battery is designed for more than performance. This battery is designed for the enthusiast along with more cranking power than other batteries of same categories. Another advantage of the battery is the battery is completely leak proof and spill proof. So, you don’t need to worry about. Additionally, this battery offers low maintenance. The battery comes with key technology named Porous microfiber separators which trap and absorb the electrolyte completely. The advanced molded side & top connection terminals are for providing durability, increased strength and versatility. 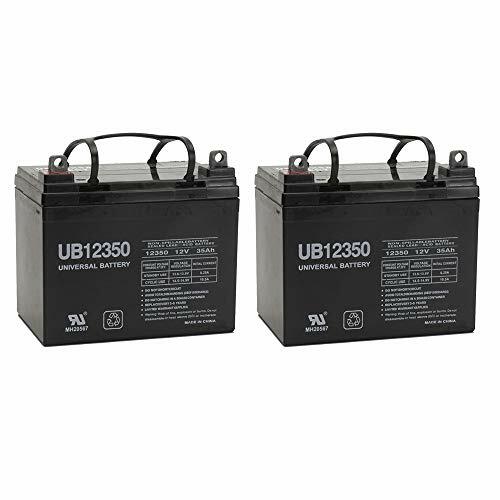 This battery is made for providing the best value to the primary applications such as Emergency lighting, Medical mobility, Solar, Security, Gate opener, ATV, Lawn & Garden, Surge protector/ UPS. This battery has been highly admired by the users and they’re satisfied with the performance of this excellent battery. No major cons, just you need more of them. The Exide 24 MDP is a compact and lightweight golf cart battery. The weight of the battery is only 44 pounds and the dimension is 10 inches in length by 9 inches in width by 6 inches in height. This battery is a dual purposes use battery which is combined with deep cycle capability along with enough power. It is highly able to start an engine of 350 HP and can provide continuous 10 AMPs, 12 Volts draw for 8 hours. The SAE posts and stainless steel threaded provide an ease installation. This battery also has pretty good permission for uncluttered electrical connections wiring harness. This battery has Lead/ Antimony based construction. The enveloped separator is great for surrounding the plates. The positive balance performance of the battery has added extra value to the battery. The SureLife Graphite technology is applied in this battery which maximizes the available energy capacity. This also helps the battery to perform at higher level and longer. The special valve system helps for water recombination reaction that reduces water loss and prevents the batteries from drying out. Special engineered alloy ensures maximum life, even under extreme operation conditions. Thick positive radial grids are present in the battery in order to perform a balanced cycling/ starting. The Robust poly case reduces the distortion and provides stability. 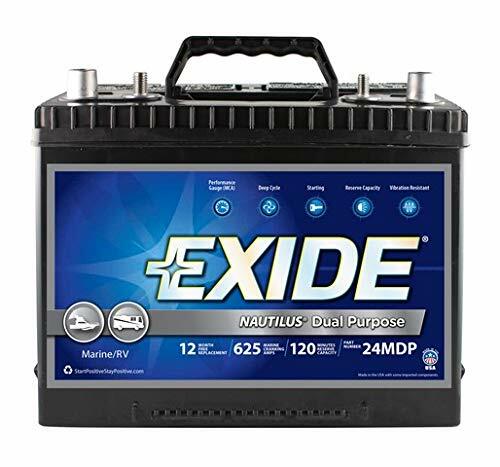 The Exide Nautilus Marine battery has 500 cold cranking Amps (CCA) at 0 degree Fahrenheit and 625 marine cranking AMPs (MCA) at 32 degree Fahrenheit. This battery is made for providing the best value to the primary applications as the commercial too, such as Surge protector/ UPS, Marine uses, Golf carts, Emergency lighting, ATV, Medical mobility, Solar, Security, Lawn & Garden. This battery has been admired by the previous users and they’re satisfied with the great performance of this battery pack. You need to consider some things before purchasing your battery. Choose a battery on your needs. Think carefully, if your battery is really able to fulfill you need. Only the price consideration is not enough. You need to consider some other factors like battery type, energy rate, capacity, dimension & weight, terminal type etc. here are some things you must consider before buying. Capacity plays an important role for the battery. Note that, the capacity can be increased by creating a parallel connection. For example, you can connect 2 Trojan T-605 deep cycle flooded 6 volt 210 Ah rated batteries with a parallel connection. It will provide you 420 Ah capacities. But remember, the voltage won’t increase. You need to know about the system voltage before selecting one. It depends on which and how many batteries are you using. 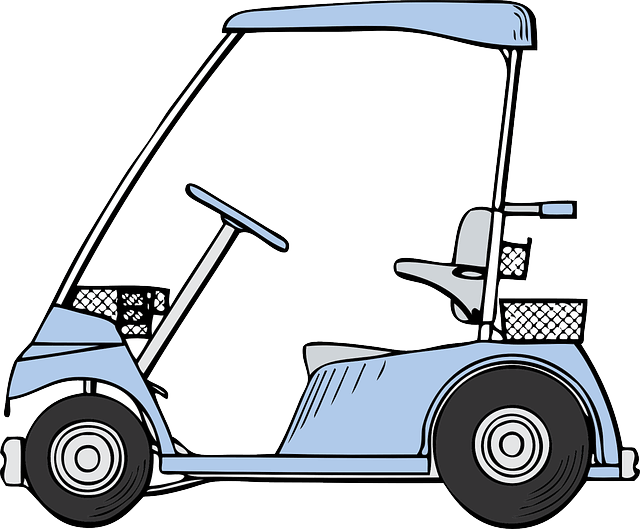 Golf carts generally run on 6, 8, 12 or 24 volts batteries. You can use 8x 6 volt batteries, 6x 8 volt batteries, 4x 12 volt batteries or 2x 24 volt batteries that fulfill the requirement of 48 volts. In this case, you need to consider the battery pack cost, size and type of battery section etc. Before buying battery, be sure this will suit you most. Finally, before buying a new one, you need to look after the connection & terminals of the battery. Figure out which terminal option will be best for your golf cart energy need. Check the terminal numbers in the selected battery and ensure your cart run perfectly with the right cable. Right cable is important as they prevent overheating of the battery. Here are some key features of golf cart batteries are mentioned. Check this out why they are different from other batteries. ​These types of batteries are designed for high density components for ensuring the longevity as well as the protection of the short circuit system. This feature also protects power generating components. These types of batteries are made with thin and high density fasted lead plates. For this reason, the battery reinforced more power and able to hold up the power against the long cycle of continuous discharge and recharge cycle. Enhancing the battery life means more deep cycling and more cycle number. Most batteries for golf carts has best deep cycling technology that is able to generate 800-1500 discharge cycle to around 50% capacity. ​Golf cart batteries are made for better current flow and maximum power deliver with an optimized design. These types of batteries contain fitted partition connectors with cast on strap which is for better and more effective electrical conductivity as well as it helps to reduce the vibration. These types of batteries need a very low maintenance that can be considered as maintenance free. The batteries have heavy duty capabilities casing which weathers the storm and helps to resist breakage for safeguarding the equipments along with increasing the longevity. First, disconnect the battery from your golf cart or other places where you’re using it. Now place the battery into the charger and charge it fully. After removing the battery from the charger, allow the battery about 12 hours to sit for. This method will prevent any surface charge which can give an inaccurate reading while measuring. Until you finish the test, do not reconnect it with the golf cart. Well, now remove the cell caps of the battery. Cell caps are the plastic caps which are situated at the top of the battery. Now, insert the Hydrometer probe in the 1st cell. For syringe type Hydrometer, pull up on the plunger in order to draw up fluid into hydrometer. For Squeeze bulb hydrometer, you need to squeeze the bulb and release this to draw fluid into hydrometer. It’s time for the results. Now read the specific gravity from the indicator of the hydrometer. Let the fluid to return the cell. You need to repeat the “step 03” for each cell of the battery. If the indicator indicates 1.265 of specific gravity, then it means of 100% charge. And 1.12 or less specific gravity reading indicates that the battery is fully discharged & won’t accept any charge. And most important thing is if a cell varies by 0.05 or more specific gravity reading from other cells, it might be a dead cell. If you maintain your golf cart battery and take proper care, then your battery will serve you longer with continuous performance. To maintain your battery, here are some tips. Follow them, you will get better performance. Check your battery regularly and use distilled water. But remember, use only up to ¼ inch over the lead plate. Do not overfill. Overfill can be cause of damage and lead corrosion which will harm the battery badly. Most of the golf cart batteries require charging after each use. So try to recharge your battery after each use. And don’t forget to keep the tickle charge ongoing while the battery is left idle. And don’t use a smaller charger than recommended. Also, wet battery recharging can be harmful to battery, so ignore it. ​The connection and the terminal can get dirty easily as you use it in the golf cart. So you need to clean this after a regular period. For this work, a wire brush or brush terminal cleaner will do this job easily. But remember; use it for removing only dust or dirt. If you notice any acid on the surface then spray a little baking soda on it and then clean with water. 80% of the batteries become failure because of lead sulfate build up. So, in order to prevent this problem, desulfation is a great way. Additionally this keeps the charging time short. Store your battery in a safe place which is not so cold or hot and away from direct sunlight. Proper storing can increase the life of the battery. And use battery maintainer after a regular period. But don’t forget to use it when your battery is fully charged appropriately. Well, after reading this complete guideline of golf cart batteries, we hope you can now find the best one that suits you most. But remember, finding the right one is a little bit tough, but taking proper care is harder. Proper care lets you to get the best service from your battery as well as it lengthen then battery life. Additionally, it reduces your cost on the golf cart. So, it’s not only important to buy the best one but also proper maintenance is important. Hope you will gain the best performance from your battery. Good luck!